The fairy tale of “Jack and the Beanstalk” has been around for centuries, but this is the first time that it has been presented in such a unique, innovative way. 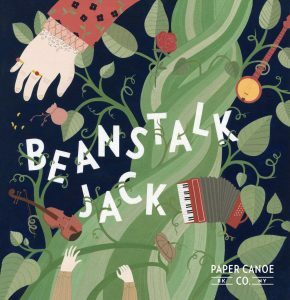 The all-original 16 songs on Beanstalk Jack feature vocals by Paper Canoe co-founders Tami Stronach and Greg Steinbruner, backed by top-notch musicians, and tell the story of a young man bearing a guitar who climbs a beanstalk, meets the Giant, and the Giant’s daughter Harmony. Harmony joins Jack and they run away to follow their musical dreams. The first half of the album relies heavily on a folk/folk-rock sound, paying homage to the sounds of folk greats like Simon and Garfunkel and Woody Guthrie. Once Jack reaches the summit of the beanstalk, the music takes on an almost musical theater quality to its arrangements, with hints of jazz, 50’s rock, pop and more emerging. Familiar elements such as the cow and Jack’s mother are included as well as a very dark and ominous version of “Fee Fi Fo Fum.” Each song can be enjoyed on its own, but when put all together, they tell a beautiful, thrilling tale that is perfect for family listening. Check out this adorable video for “Hey Wow” from the second half of the album, Beanstalk Jack.